Did you know that we ONLY charge £1 per book post and packing anywhere in the UK? As it's the season of goodwill, we are offering our customers 10% discount for orders over £15 and an amazing 15% discount for orders over £25 (excluding P&P charges - T&Cs apply, see website for details and discount coupon code). This is the ONLY place on the web where you will find the full, up-to-date catalogue of 'Inn Way' and 'Walking Weekends' walking books. Have I mentioned that we only charge £1 per book post and packing...? 2 inches of snow overnight on Saturday transformed Upper Nidderdale in the Yorkshire Dales into a winter wonderland. At Pateley Bridge, just down the valley, the fields and hills were green, but beyond Lofthouse the snow gradually increased in depth to several inches on the high moors. It was a clear, cold day with great visibility and no-one else around. We set off from the Yorkshire Water road near Lofthouse and climbed up to an old track at Thwaite House Farm, then followed this up through the valley, passing several old farms, to reach Scar House Reservoir dam. The water level was high and water was pouring across the overflow straight down the front of the dam wall - very impressive. That said, the riverbed was dry near Lofthouse, as the river almost always sinks at Manchester Hole and Goyden Pot unless there has been particularly heavy rain. After crossing the dam wall, we followed the track up onto the moors before a gradual descent to Middlesmoor, with superb views down the valley towards Gouthwaite Reservoir. Got to the Crown at Middlesmoor at 3:10pm expecting it to be closed, but it was full of locals, the fire was roaring and the beer tasted great. Just a 30-min walk left in fading light back to the car. 'BREATH OF FRESH AIR' monthly walks series for ITV Yorkshire. Watch ITV1 Yorkshire 'Calendar' tonight (Friday 29th August) between 6pm and 6:30pm as Mark Reid joins Jon Mitchell, ITV weatherman, on their fourth walk from their monthly TV walk series 'A Breath of Fresh Air'. 2-day walk / 14 miles / wild camp - Patterdale, Angle Tarn, The Knott, High Street, Thornthwaite Beacon, Thresthwaite Mouth, Hartsop. Wild camped at Angle Tarn. Great location, hidden away with superb views of Fairfield and Helvellyn. Got permission to camp first from Side Farm at Patterdale (always leave your camping pitch as you found it and carry out all of your waste). This is a superb mountain walk with a great variety of landscapes, views and summits that make it full of interest all the way round. The final stretch along an old track between Hartsop and Patterdale contrasts superbly with the mountainous ridge of High Street. The highlights were: waking up at 6am at Angle Tarn and not being able to see across the tarn because of the mist; red deer on the flanks of The Knott, the views from the Straits of Riggindale; view of Blea Water from High Street's eastern edge; Thornthwaite Beacon and the steep descent ot Thresthwaite Mouth; the long descent through the valley of Pasture Beck. Mark Reid, author of The Inn Way guidebooks, and Jon Mitchell, ITV's weatherman, have embarked on a new monthly television series of walks for ITV Yorkshire, entitled 'Breath of Fresh Air'. The first walk, around Hathersage and Stanage Edge, was aired on Friday 25th April. Bright, clear but exceptionally cold, especially above 700 metres with patches of snow and significant windchill. Still, that didn't stop one bloke who I passed on High Raise who was happily fell-walking in these winter conditions wearing trainers, jeans, a lightweight coat but wasn't carrying a rucksack. And he was on his own. Adventurous, naive or just plain daft? The hordes were left behind at Easedale Tarn, after which I only saw another 9 people (including the bloke in trainers) all the way round via Sergeant Man, High Raise and Greenup Edge back down to Grasmere. The route I took was Grasmere, Easedale Tarn, Coldale Tarn, Blea Rigg, Sergeant Man, High Raise, Greenup Edge, Far Easedale, which took me 5 hours to complete. A superb mountain day, and the hidden Coldale Tarn was a particular highlight, as was the views from Sergeant Man. Went out yesterday (Monday) with Jon Mitchell, ITV Yorkshire's weatherman, to film the first of (hopefully) a series of 'Walks of the Month' to be shown on ITV Yorkshire's Calendar. The first walk we did was around Hathersage, North Lees, Stanage Edge and Higger Tor, finishing at the Scotsman's Pack. This should be screened at the end of April. I'm often asked to name my favourite pubs, but there are so many to choose from and it all depends what you're looking for. Yorkshire Dales - Falcon at Arncliffe. Classic, timeless, unspoilt Dales country inn where beer is served straight from the barrel. Lake District - Sun Inn, Coniston. At the foot of the fells, with a roaring fire in asuperb cast-iron range and some great local ales on tap. 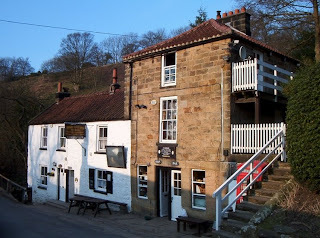 North York Moors - Birch Hall Inn, Beck Hole. One of England's classic country pubs. Full of character with two small bars and a tiny shop sandwiched in between. Peak District - Old Nag's Head at Edale. Classic walkers' pub at the foot of Kidner Scout. April Fool's Day and a walk in Upper Wharfedale. The weather is certainly having a laugh at the moment. This time last year we were basking in unseasonably warm spring sunshine; 1st April 2008 I got blown off my feet by 50mph winds on the flanks of Buckden Pike. And there's snow on the way this weekend. But to be honest, I often prefer walking in adverse weather conditions rather than dry, sunny days as the weather provides a challenge. In fact, it was quite exhilerating walking across the flanks of Buckden Pike being buffeted by gale force winds and horizontal freezing rain. My new Berghaus 4-seasons Trek pro-shell coat withstood the elements and kept out the wind and rain. I sheltered from the wind behind a drystone wall. This wall was probably 200 years old and was perfectly intact, so skilfully built that no wind could get through it. The perfect spot for a flask and mars bar.